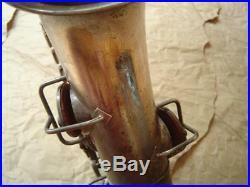 Early Vintage King Silver Plate Alto Saxophone. Serial #84xxx The finish is nearly all intact, however there is much tarnish (see photos). Thorough cleaning and polishing are needed. The bell has been polished for a better view of the bell engraving (this may look like finish wear on the bell, however there is no wear on the bell). The physical body is in great shape, with very few dings; and there is no sign of any major repair. The pads are shot and need to be completely overhauled. Photos tell the rest of the story. Photos are slightly magnified and make some blemishes appear larger than they actually are. For smart phones and mobile devices: P. Lease note that the photos appear one at a time, but all 10 can be seen by scrolling through the dots at the bottom of the photo. Please write with any questions. Get images that make Supersized seem small. Tailor your auctions with Auctiva’s. Track Page Views With. Auctiva’s FREE Counter. The item “Early Vintage King Silver Plate Alto Saxophone” is in sale since Tuesday, October 30, 2018. This item is in the category “Musical Instruments & Gear\Vintage Musical Instruments\Vintage Wind & Woodwind\Band & Orchestral\Saxophones”. The seller is “john8p4m” and is located in Great Barrington, Massachusetts. This item can be shipped worldwide.